While we all wish we had unlimited hours to spend with our furry best friends, some days are busier than others. A walk around the neighborhood, or making sure our dog’s get enough active exercise each day, isn’t always possible. 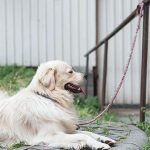 Luckily, there are dog leads, tethers, and tie-outs available that help our pups get their energy out without the constant supervision that’s required of hands-on leashes. 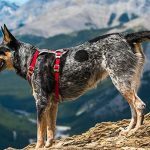 Ranging from the simplest of cord leads to decked-out pulley systems, there’s a hands-free dog tie out there that can get the job done! Pet Champion is a well-respected name in dog ties and cables, and this model is no exception. 30-feet of strong, but lightweight steel and vinyl-covered cable, this tie out gives your dog the freedom they’re looking for without getting too twisted. Crimp covers protect the cable ends from rusting or weakening due to weather. 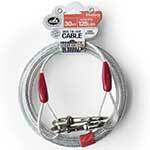 Tested to withstand pulling from dogs up to 125 pounds., this cable attaches to fixtures or stakes and doesn’t budge. Cons: Stake is sold separately. Perfect For: Securing extra-strong pups safely. Not all of the options below include a stake with the tie-out, and some of them don’t include tie-outs or cables with the stake attachment. You may need to mix and match for best results. We talked in detail about our top pick, Pet Champion Heavy Tie Out Cable, now let’s take a look at some of the competitors. The Petmate Easyturn Stake makes setting up an outdoor lead system for your dog a breeze! The 18-inch stake resembles a screw and can be easily twisted into the ground to act as a solid hook. 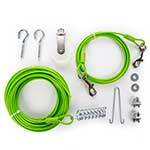 The included galvanized steel cable is coated with a weather-resistant poly-vinyl coating and attaches to the stake with ease. 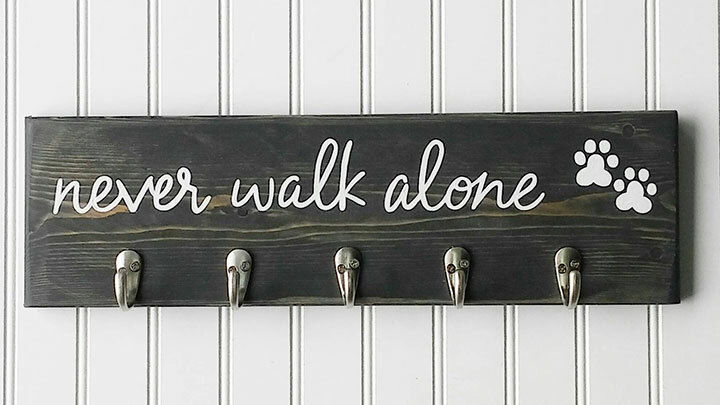 Use it in your yard or while traveling for hands-free walks. Pros: Affordable, durable tie and stake. Cons: Depending on your soil density and consistency of rain, this could stay in the ground better or worse for some people. Perfect For: Any yard of dogs up to 100 pounds. The Four Paws Trolley Exerciser allows your pup the freedom to run and play with a unique trolley system. The 50’-100’ heavy-duty cabling attaches to two fixed points in your yard with a pulley system between them. The pulley attaches to a 10-foot lead, allowing your dog the freedom to roam wherever you choose! This option is great for allowing dogs along a certain side of your yard, while avoiding gardens or trash storage. Cons: Only good for permanent areas – if you don’t have trees or a side of the house to attach it to, you would need to buy fixtures. Perfect For: Dogs under 50 pounds. allowed only in one part of the yard. 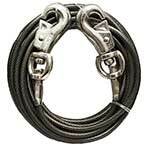 The 30-foot BV Pet Reflective Tie-Out Cable is reflective for extra safety at night. You’ll have extra peace of mind knowing your pup will be seen easily if visible in your busy neighborhood. The 100% steel cable is lightweight and comes equipped with clips on each end for easy attachment to trees, fixtures, or stakes. With three available models for dogs anywhere up to 250 pounds. (huge! 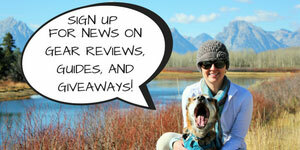 ), you’re sure to find one that fits your pup’s unique needs. This cable is cold-weather approved and quality tested to last a long time. Pros: Reflective coating makes for great visibility. 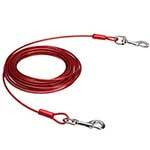 Perfect For: Busy neighborhoods or out in the country where the reflective cable can add to your pet’s safety. This unique SUREswivel Swiveling Pet Tie-Out anchors into the ground anywhere you go to give your pet hands-free, tangle-free exercise! The base rotates 360 degrees to allow full freedom of movement without the tangling and knots of other cables. Secure the stake in your backyard, or while traveling to walk your dog hands-free! Pros: 360-degree movement, easily portable. Cons: Rain or otherwise soft ground can reduce its hold in the ground. Be careful! Perfect For: Camping, traveling, or permanent yard tie-outs! 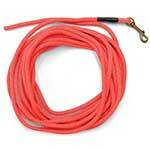 The high visible bright orange SportDOG Check Cord Dog Leash is 30-feet long and lightweight. Designed to prevent knots and be tangle-free, it easily coils up to go where you go. Brass clips on either end clip onto your dog’s collar or fixtures in your yard. Made for dogs of all sizes, it’s a good, sturdy lead that won’t scratch your hands like a worn-out cable lead might. Pros: Soft cord, bright color. Cons: No stake or attachment fixture included. Perfect For: Keeping an eye on your dog of any size while he roams the backyard. 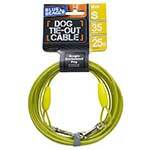 This colorful Favorite Tie Out vinyl-coated galvanized cable offers a 30-foot radius for your dog to run and play. Clip one end to your dog’s collar and the other around a tree, or use the included screws and springs to affix the cable between two objects in your yard for a designated run. Made to withstand the pull and weight of a dog up to 50 pounds., this cable is durable and reliable as a backyard dog accessory. Springs near the clips prevent jerking when you pet reaches the end of the line, keeping them safer and out of harm’s way. Cons: No stake included, so you may need to get one separately. Perfect For: Dogs weighing up to 50 pounds. 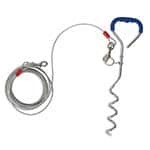 The Prestige Super-Beast Dog Tie-Out name pretty much speaks for itself in that this 30-foot lead is made to withstand pulling from dogs up to 250 pounds.! It features patented swivel snaps on either end to prevent tangling and knots, ensuring your dog stays safe and unable to wriggle free of the clasps. 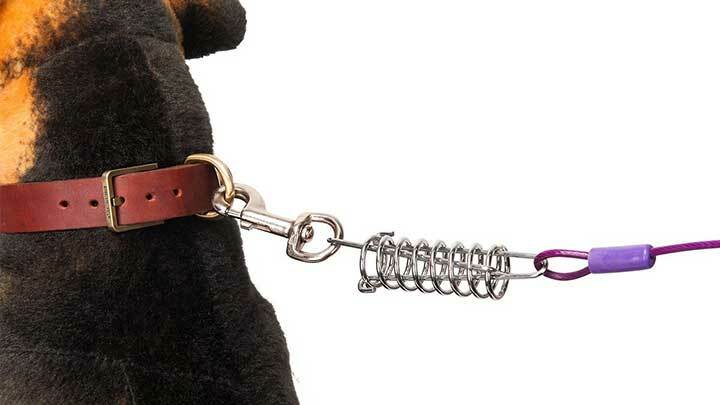 This strong, heavy cable and clasp combo is made to keep the largest of dogs on lock. Pros: Heavy duty, strong cabling. Cons: Too heavy to lift for smaller or medium-size dogs. Perfect For: Large dogs that like to spend a lot of time outdoors. 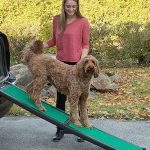 The 50-foot Top Paw® Trolley Dog Tie Out is excellent for giving your dog a lot of freedom without worrying about a cable or lead dragging the ground. 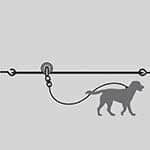 Along with the 50-foot cable comes a trolley system that suspends along the cable and attaches to a tie-out for your dog to move about as it pleases. Just attach the hooks between your house, two trees, or any fixtures and set up the cable between them to give your pup the exercise they’re craving. Pros: Keeps the lead off of the ground, which makes for less mess. Cons: Must be permanently attached, so it’s a little harder to move. Perfect For: A side yard lead for any size pup. Weight matters. 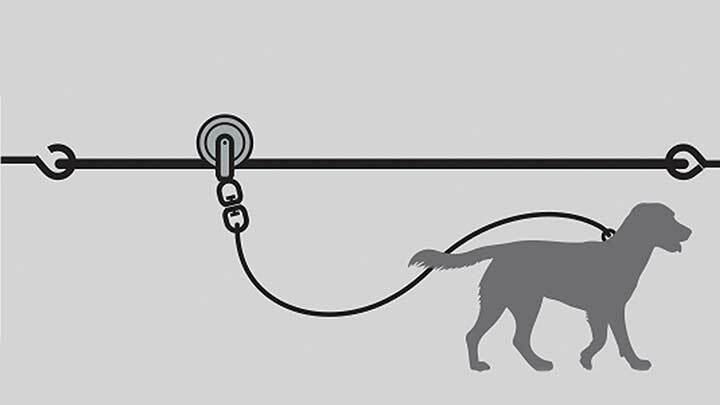 Your dog’s weight corresponds directly to the length of chain you should get. Most cables are tested and rated by a dog’s weight. Be sure to check the packaging before purchasing to ensure that the cable’s durability and length will suit that of your dog’s breed and stature. Buy a chain or tether that fits your area’s seasons and temperatures. The weather has a huge effect on the lifetime of any outdoor equipment, and dog chains are no different. Cold temperatures especially can shorten the life of cables. Look for a material that can withstand your harsher weather conditions for a decent amount of months or years, depending on your needs. If using an in-ground stake for your tie-out, it’s always recommended to check that it’s secure before leaving your dog unattended. 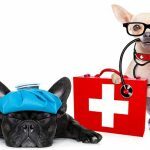 Granted, most of us are not comfortable with leaving our dog unattended, and shouldn’t do so for more than a few minutes, but sometimes it is necessary. 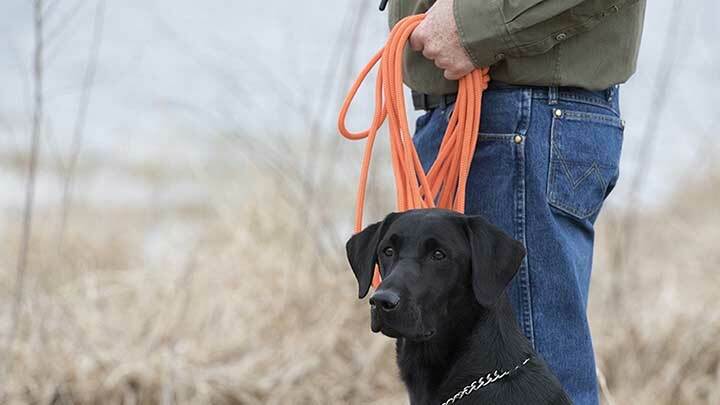 When staking a new lead for your dog, make sure you check and double-check that it’s secure. Especially when camping or traveling! Keep in mind that tangling CAN occur. 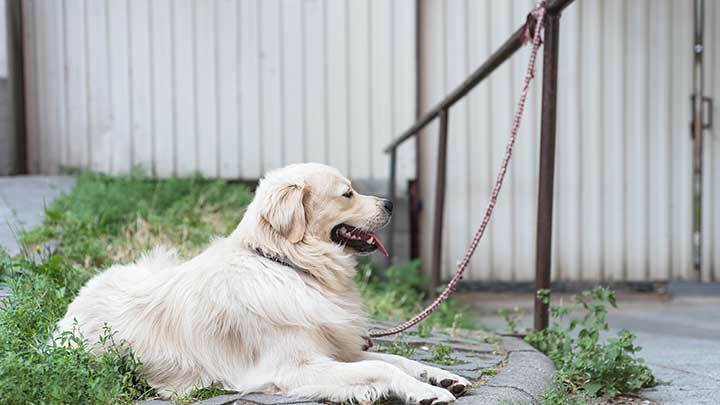 Any long length of cable or lead is capable of tangling or knotting, and at worst, this could pose a threat to your dog’s safety. 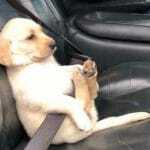 It is not recommended to leave your dog unattended when on a tie-out, as they could unintentionally hurt themselves. Visibility is key. Piggy-backing on the last bullet, it’s very important to buy a dog chain with visibility in mind. Whether you’re viewing from a window or across the yard, you should be able to see where the chain is and pinpoint your dog’s location accordingly. Many leads are made reflective for this very reason.